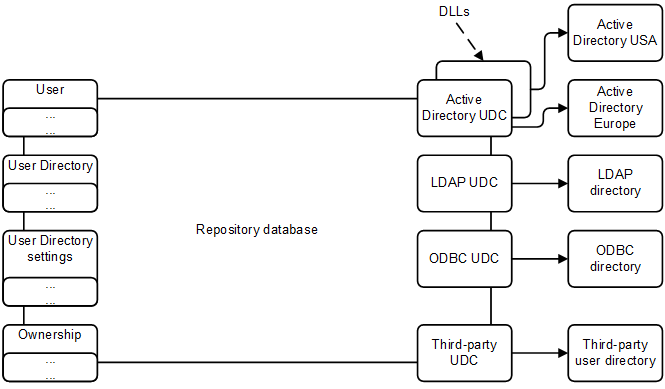 This documentation describes the Qlik Sense User Directory Connector (UDC) API. The UDC API is used to import users and groups in Qlik Sense. There can be multiple instances of each UDC in a Qlik Sense deployment. Note: For Microsoft Active Directory, a UDC must be configured for each domain. When configuring in the Qlik Management Console (QMC), the name of the user directory must match the one sent with the user ID when requesting a ticket from the Qlik Sense Proxy Service (QPS). The DLLs implement a .NET UDC API defined by Qlik Sense. The DLLs are loaded dynamically when they are configured in the QMC.